ZOC is a professional terminal emulation software for Windows and macOS. Its impressive list of emulations and powerful features makes it a reliable and elegant tool that connects you to hosts and mainframes via secure shell, telnet, serial cable and other methods of communication. 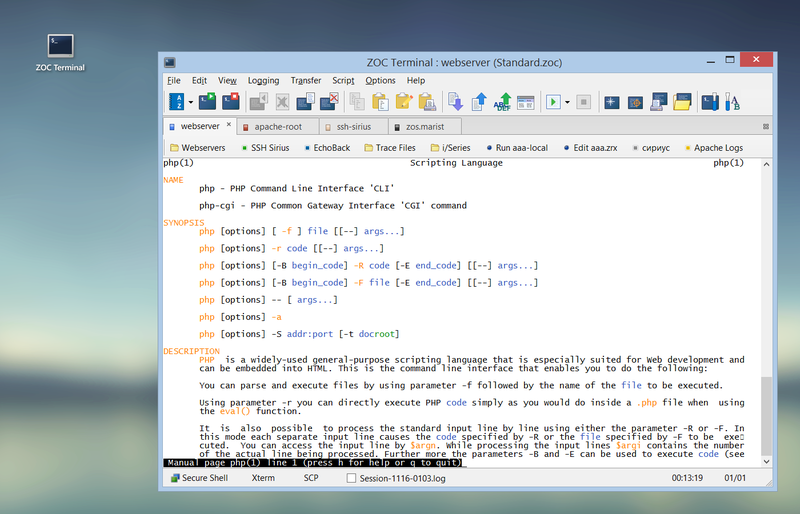 Start your free 30 days evaluation and download ZOC Terminal V7.23.3 for Windows or macOS, or check the version history. ZOC is based on OpenSSH and supports the latest key exchange and encryption methods that the SSH protocol (RFC 4253) has to offer. Unlike OpenSSH, this ssh client is wrapped in a modern tabbed user interface with a powerful host directory, industrial strength emulations and scripting. Below is an overview and explanation of some core SSH features of ZOC Terminal. We also have a whitepaper offering a more technical description of SSH. An especially difficult part of encrypted communication is the need to negotiate a shared secret (the key to use for encryption) over a public channel that could already be compromised. The negotiation is performed through the so called Diffie-Hellman exchange or a variant thereof. ZOC supports all official diffie-hellman group exchanges, as well as the more modern ecdsa-sha2 and curve25519-sha256 protocols. Authenticating describes the process, where the user presents proof of who he is and the server deciding, if the user should be allowed access. The SSH protocol describes various methods that can be used for authentication. Of those, ZOC supports password authentication, pukey exchange and keyboard-interactive challenge. Public-key exchange comes in various flavors. ZOC understands RSA, DSA, ECDSA and ED25519 keys. It is also possible to use hardware based key authentication (e.g. smart cards). Over time, the SSH protocol has seen a plethora of methods to be used to encrypt the communication (using shared secret was negotiated during the KEX phase as a cryptograhpic key). Some ciphers were phased out over time, especially after Edward Snowden revealed how powerful possible listeners like the NSA are, and new ones were introduced. ZOC supports the whole list, starting with aes256-ctr and going down to older ciphers like aes256-cbc or arcfour (these older ones may still be necessary to connect to older servers which have not been updated in a while). An important part of the secure shell protocol is a feature called port-forwarding. This feature allows the user to create a connection from the client computer to the server network, which can be used by other programs and where all the connection data is encrypted. This feature is sometimes called tunneling. The standard port-forwarding feature requires the client to set up the tunnel source port and destination before making the connection. This means that there is limited flexibility and that for each possible destination, a separate ssh tunnel needs to be set up. With dynamic port forwarding however, the client sets up a listening port, but when a software connects to the port, it can select host and port it wants to connect to. The ssh client will then forward the connection request to the SSH server which initiates the connection to the final destination. In some environments, end user computers are not allowed to access the outside internet directly. In those cases, connection and data exchange is made by way of a ssh proxy which handles the actual connection to the outside network (internet). There are various type of proxies, which mainly differ in how the ssh client requests a connection to the outside world. Most common types are SOCKS-4, SOCKS-5 and HTTP. When a user authenticates an SSH session using a public/private key pair, ZOC supports the SSH agent forwarding technique to provide the key for authentication in secondary ssh sessions (ssh connections to a third server, made from typing a ssh command in the remote shell in the initial connection). If all the servers allow authetication through this specific ssh key pair, it is not necessary to provide the passphrase again for secondary ssh connections. X11 is a communication protocol which allows a remote computer to run programs with a graphical user interface on a remote computer (normally, the server can show text only through a terminal client). SSH supports a way to tunnel this type of communication between ssh client and server, thus enabling the user to run an X11 command like xeyes on the remote shell and get the window for that displayed on the local computer.